The world's biggest oil companies are gearing up to present their latest quarterly profits from this week, providing a first glimpse of their performance in the wake of hurricanes Katrina and Rita. Key production sites in the Gulf of Mexico were battered by storms in late summer, forcing the shutdown of major US oil refineries whilst helping to drive up the cost of crude to record levels. "These numbers are going to be very, very noisy," says Matthew Lanstone, a senior oil analyst with Goldman Sachs. BBC News looks at what could be in store for some of the world's leading oil companies. 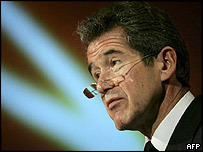 BP boss Lord Browne has grand ambitions for Britain's biggest company. He has invested heavily in Russia and the US recently, while his executives have reportedly been courting Chinese state-owned operator Sinopec. 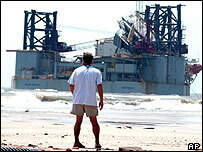 But as a major player in the Gulf of Mexico, BP has felt the fallout from hurricanes Katrina and Rita. "Gulf of Mexico production shutdowns combined with maintenance activity in the UK look to have eaten into any profit uplift (from the soaring price of oil)," say analysts at Deutsche Bank. And while BP has been making money at its refineries, it has been feeling the pinch at its petrol stations - particularly in the US - where the company makes comparatively little at the pump. "We expect results to be weaker than in the second quarter as a result of the effects from Hurricane Katrina and severe pressure on marketing margins," analysts at JP Morgan say. BP's total production of 2.8 million barrels per day, excluding output from its TNK-BP operations in Russia, looks set to be 5-6% below the previous quarter. "Despite these negatives, a strong cash flow has ensured that monies returned to shareholders remain at all time highs," says Deutsche Bank. Analysts expect BP's third-quarter adjusted net income to be in the region of $5.5bn (£3.1bn), little changed from the previous quarter but well up on the same time last year. Anglo-Dutch giant Shell has been through turbulent times of its own in recent months. The company merged its separate UK and Dutch arms in a bid to restore investor confidence after a damaging - and costly - reserves scandal last year. As the leading player in the Gulf of Mexico, Shell is particularly prone to the slow pace of recovery in the region. JP Morgan estimates total losses for Shell from the hurricanes "in the order of 130,000 barrels per day". Deutsche Bank forecasts that quarterly production at Shell "looks likely to be 10% down on a year ago". Meanwhile, the company has been hit with month long production setbacks at its Gas & Power division in Nigeria and Australia. "We've taken our numbers down on both Shell and BP," says Goldman Sachs' Matthew Lanstone. But like its main rivals, Shell has benefited from the rocketing price of oil. Analysts forecast an adjusted net income of about $5bn. The world's mightiest oil company appears to be in bullish form. Despite shutdowns along the US Gulf Coast, JP Morgan estimates that Exxon's third quarter production will be 4 million barrels per day, up 3% both on the previous quarter and last year. The US giant this month began pumping crude from its Sakhalin I oil field, off Russia's Pacific coast. In total, Sakhalin oilfields are thought to hold reserves in excess of 1.2 billion barrels of oil. Exxon also reported start-ups at its Kizomba B offshore project, in Angola, and Rasgas Train 4 operation in Qatar. Analysts expect that hurricanes Katrina and Rita will have had little impact on Exxon's overall production. However, in the immediate aftermath of Katrina, Exxon said it would keep fuel prices unchanged at its company-owned petrol stations. "Thus, we expect Exxon's marketing margins to be especially weak this quarter," JP Morgan says. 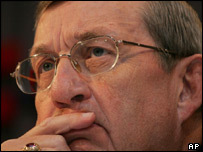 Exxon's tough talking boss Lee Raymond is due to retire at the end of the year. Analysts forecast third-quarter adjusted net income for Exxon in the region of $9.4bn - a sizable jump on the previous quarter. Of the European oil giants, France's Total is the producer least likely to feel the negative effect from hurricanes Katrina and Rita. "Modest Gulf of Mexico exposure and solid crude price realisations should ensure that third quarter results at Total read well when compared with the other supermajors," says Deutsche Bank. "Reported production declines are expected to be lower that those for Shell and BP." Deutsche expects the hurricane-affected region to have hit Total's production by a relatively modest 40,000 barrels per day. However, analysts point to project delays in Yemen, Angola and Nigeria. Strikes at refineries in France, which began in September, have hit some refinery production, JP Morgan says. 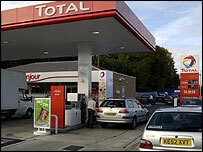 As with its rivals, Total is has encountered a difficult retail market, especially in the UK and Germany. Analysts estimate Total's third-quarter adjusted net income could come close to 3 billion euros ($3.6bn; £2bn).